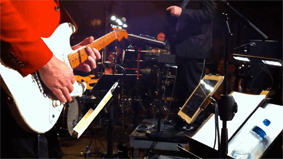 This is the second ever -crowd sourced- multi camera concert video registration. 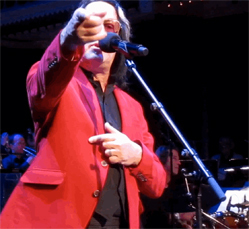 The entire concert, seen through the eyes of Todd Rundgren fans' video cameras and HD smartphones. Paradiso Amsterdam, November 11, 2012, 8:30pm. 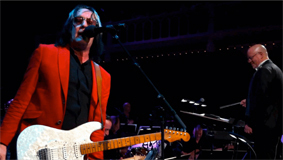 The Metropole Orchestra and Todd Rundgren, brought together for the second time by radio DJ and music connaisseur Co de Kloet. A little over a year ago a similar event took place, maybe even more special because it was a first. Even Todd did not know exactly what to expect until he stood in front of this fabulous 60 piece orchestra. He may even have underestimated it to some extend as most of the preparations, like the setlist and the orchestral arrangements, were done without him by the producer and the young orchestrator Tom Trapp. Both Todd and the orchestra were very focused and gave their best. 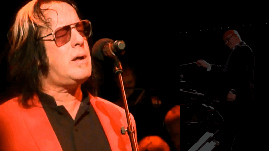 Tom Trapp's orchestral arrangements added many new elements to the original songs, some of which Todd never even performed live. But the essence and detail of the songs were so well kept that Todd could just rely on his routine and his compositions to help him through the -at times- overwhelming new experience of being the solist in front of this big orchestra. Even though he suffered from a flu, his singing, timing and performance was stunning and at times very emotional. The orchestra and conductor Steve Sidwell were amazing too. It turned out to be a magical evening. I could only imagine what it must have felt like for him to hear and perform his songs with such a rich musical palet for the first time. I was standing so close that night that I could see and hear every detail, every emotion. And when I pulled out my iPhone I realized on the spot that I had to keep filming. This special moment in Todd's amazing career and the beautiful sounds coming from that stage needed to be documented and I'm glad it turned out the way it did. At the time of this writing over 40.000+ fans had watched the entire show on YouTube with some 1000 new views every week until this very day. So here we are, one year later. 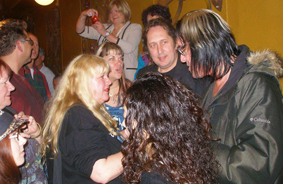 The night before the show I met with Dutch and international fans in a nice Amsterdam cafe. Jill Mingo from Scotland DJ'd and I met some very nice people, like Mark form New York, a sound engineer who sometimes works for Todd when he's in NY. Mark told me that whenever Todd talks to people about the show he mentions my video, as he would do the next day on Dutch national TV. They even showed some footage. I felt relieved, because I had been a bit insecure about this whole 'pirate' project, did not know how it had landed with Todd even though I reckoned he would appreciate the fact that is was documented. A few hours later I would be able to ask him myself, as around midnight he walked in, accompanied by photographer Claude Vanheye, who I knew well from another life when I was a young music journalist working with Claude on features for popmagazine Muziek Expres. Claude introduced me to him and I asked Todd if he had seen the video. I admitted to him I felt a bit embarrassed about it. Todd just laughed and said: "Are you crazy...?" We then talked a while about the concert and the rehearsals. Todd said he was much better prepared for it this time and was enjoying his time in Amsterdam and Hilversum. Being so pleased with how last years' video turned out, I had no intention to do one again. I actually expected an official video or DVD to be made this time. But when I asked him about this, Todd said the producers did not have the budget for it and they somehow could not organize it in time. To my surprise he then added -with a big grin: "But hey, you're here, be my guest!" Had to do it. Again. And so I found myself in Paradiso, in the same spot the following night. Same lights, same orchestra, same people, it felt somewhat weird, like being in my own movie as I had watched all these details before so many times during the many editing hours. I still had not decided if I should record or not, I came unprepared, no real camera, no preproduction whatsoever. But the circumstances were even better than last year. Within a few feet: the backing vocals on the left, Todd on the right. Like last year I could capture both Todd and Steve Sidwell in one frame. I quickly confiscated my GF's iPhone so now I had two: one for the backing vocals and one for Todd. Praise Steve Jobs. No way you can keep such a small camera steady, let alone two of them for over two hours. But there Todd was, counting on me. ;) Even addressing my 'cameras' every now and then. I just had to do it. Again. So here it is, for Todd and all of us. Enjoy! I could not have completed this without additional footage. This time I did not have to rely solely on YouTube since several people spontianiously offered me their recordings. Unexpectedly an old friend/collegue Dirk-Jan turned up next to me with some amazing material he shot when he ran into Todd on the stairs of Paradiso after Todd did his 'boy child' announcement with the megaphone. Another guy, Peter, who I've since become friends with had beautiful totals from the front balcony. Peter also interviewed Todd on camera during the opening of an art exhibition of his brothers work and through him I met Bert Wouters, the artist who made the big painting that was hanging behind the orchestra. Then there is Jaqueline who organized the fan gathering in the cafe, she was sitting on the left balcony with a video camera. Others, like Jack who I did not know emailed me offering his footage, shot from the right front balcony. But most important: we had clean sound from the live NTR radio broadcast. Without it there's no video, it's as simple as that. I used a MacBook Pro and Apple's new Final Cut Pro X -like last year- for editing. It took some 175 hours, half of that time spend on technicalities since I had to deal with 12 different sources and video formats. Retiming, synchronizing, some color correction, making the trailer and several rendering tests to determine the right format for uploading a large file like this to YouTube and keep the audio sync. On regular projects where you have all cameras covering the entire event, one would probably make different artistic choices. In this case all I had to work with was the available footage on any given moment of the show. One giant two and a half hour puzzle. Most of the sources were incomplete or had large portions that were unsuitable because of sharpness or excessive movements. None of the sources had used tripods or covered more than a few songs. Small cameras or smartphones cannot be held steady under these circumstances. And like last year, it shows again that above all it's the artists' performance and the audio quality that determine if something like this is watchable. The video part becomes like pictures to -in this case- a beautiful musical story. It was only in the end that it became clear that each and every moment of the show was covered. Realtime too, no inserts from other moments. The full two and and a half hours! I'm extremely pleased -and proud- that the event could be documented in it's entirety and can now be enjoyed by so many all over the world. It simply had to be done. For Todd, his fans and all involved in this project. Thank you all for making making this possible! Lion Keezer is a former music journalist (Muziek Expres), record industry professional (Polygram) and currently TV producer/director in The Netherlands. A Todd fan since 1971 with a renewed interest in Todd's work since he saw 'No World Order' performed in 1994 in Amsterdam.